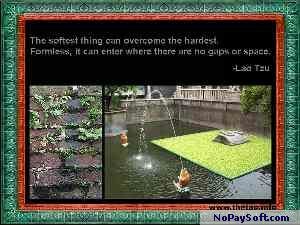 Theme includes screen saver with quotes from the "Tao Te Ching" (the world's most translated book, after the Bible) and related images. The Tao is an ancient Chinese classic and the source of sayings like "The journey of 1,000 miles starts with a single step" and "Those who know don't speak; those who speak don't know." It is related to the I-Ching and, more loosely, to Zen. Images include the Chinese gardens and Taoist temples.